Read more books: Seeing as I didn’t count the number of books I read last year versus the previous years, I can’t comment on whether I read more, but I definitely carved out some time for reading. I finished the entire Swedish/French crime series I had been reading. I read Gone Girl (then saw the movie). I am currently in the middle of the Luminaries by Eleanor Catton and the 44 Scotland Street series by Alexander McCall Smith. I think he is currently my favourite author. Take more time to create: I think I achieved this goal although most of it was still related to food in some way. I spent a little time arranging flowers, I created menus and invitations for some parties, and I designed a blog business card (coming soon!). I will definitely continue my journey with flowers and fonts this year. Take care of our home: Although we didn’t do any major makeovers, I made an effort to have a nice, seasonal centerpiece on the table most of the time, I put together a gallery wall, we changed our shower curtain and bathmat, and we got a rug for our living room! I’m going to call this one a success. On the list for this year: sell our keyboard that (unfortunately) no one uses anymore and replace it with a nice hutch for more storage space. Work hard but keep work at work/be happy when good things happen: Another couple that are difficult to measure. I did still have some breakdowns/panic attacks about work last year, but thanks to Alex, a supportive boss, and some awesome friends I got through them. I also got through 50 days of #100HappyDays and some days it was difficult to choose just one thing! This definitely put things in perspective and taught me to appreciate the little things a bit more. The same goal is on the list for this year. With thesis writing on the horizon this promises to be extra important. Take care of myself: There was a lot in this category including the Balcony Garden. I consider our first one a success although we learned some lessons as well. We plan on starting earlier this year and growing things we are more likely to use a lot of. We’re thinking cherry tomatoes, chives, cilantro… More on this when it happens! I wasn’t so good on the stretching/meditating front last year, I have to admit. The good thing is I can try again this year! I got into hot yoga and aerial yoga last year and I plan on continuing that this year as well as my usual running/weightlifting routines. Maybe add some swimming to the mix? And of course: food. After all the food and drink of the holidays it’s always hard getting started with a good diet again, but we’re up for it, right? My inspiration this year: Plenty More by Yotam Ottolenghi. I don’t think I’ve ever wanted to make so many salads. He really makes them look varied, beautiful, and yummy. 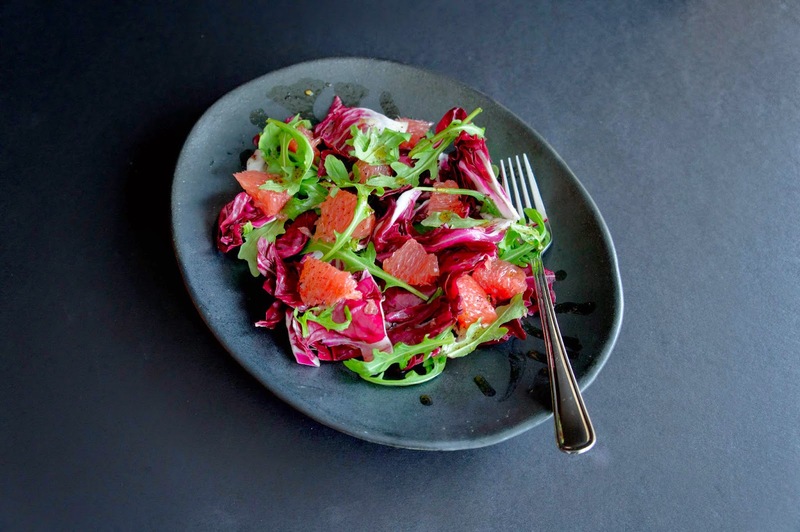 The first one on the list: Grapefruit Sumac Salad. Citrus fruits are so bright and cheerful that I never really associate them with winter, although that’s when they are in season. Also, I bought some sumac last year, intrigued by its colour, and never really used it in anything. Perfect! This salad is perfectly balanced. 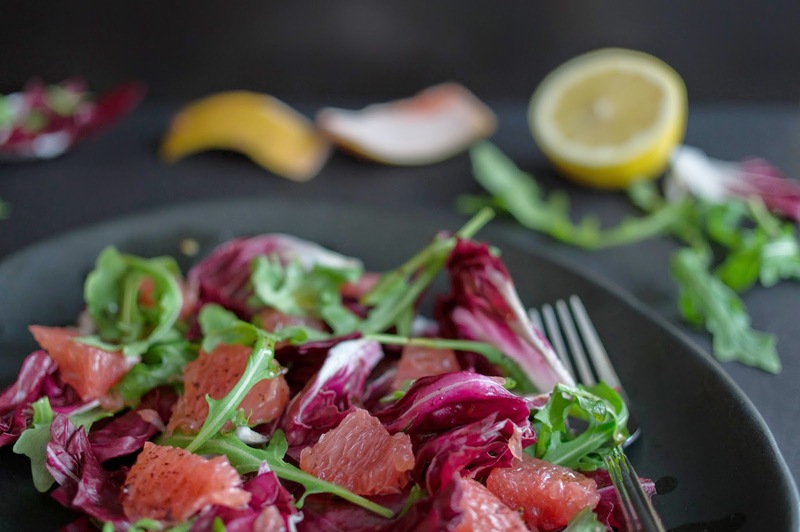 The radicchio is bitter and juicy, the arugula is peppery, the lemon juice is bright, the grapefruit is bittersweet, and the sumac adds a little something. The hot pepper flakes add just enough spice that I forgot they were there until I was a couple of bites in and thought “why is my throat warm?” And, like all my favourite salads, no lettuce. Serve with some pan fried fish for a light dinner that’ll make you feel good and jumpstart the New Year! Section your grapefruit collecting the sections and juices in a bowl. If you’ve never sectioned citrus before check out my instructions after the recipe. Pour the sections and juice into a colander over a small saucepan. Let sit for 5 minutes to drain. Carefully place the sections in a large bowl and set aside. To the saucepan with the juice add the sugar and chili flakes. Bring to a boil and let reduce until the sauce has slightly thickened and you have a few tablespoons left. Set aside to cool slightly. In the meantime strip the leaves off your radicchio, wash, and dry them. Rip or cut them into medium sized pieces and add to the bowl with the grapefruit. Wash and dry your arugula and add it as well. 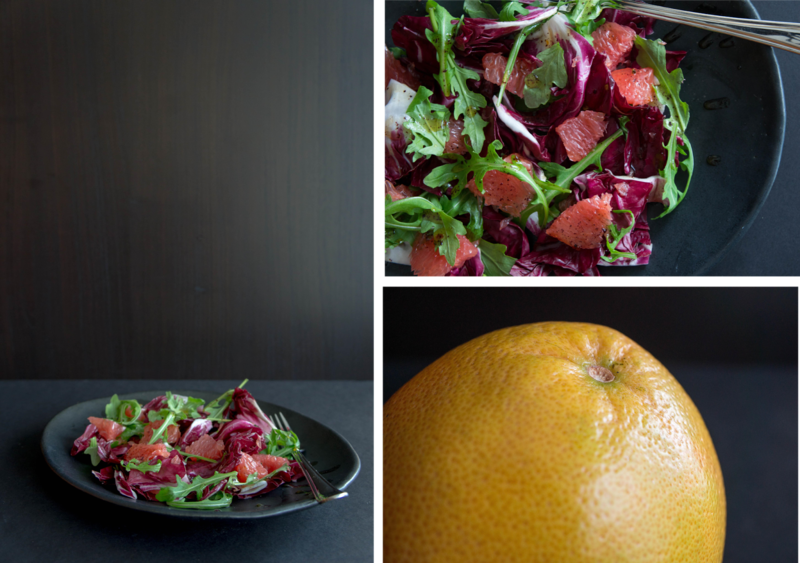 To finish the dressing, whisk the lemon juice into the grapefruit juice reduction. Drizzle in olive oil while whisking until the mixture emulsifies (slightly thickens and looks uniform). Start with 3 tablespoons. Add sumac and salt to taste. If the dressing tastes too acidic add some more olive oil. 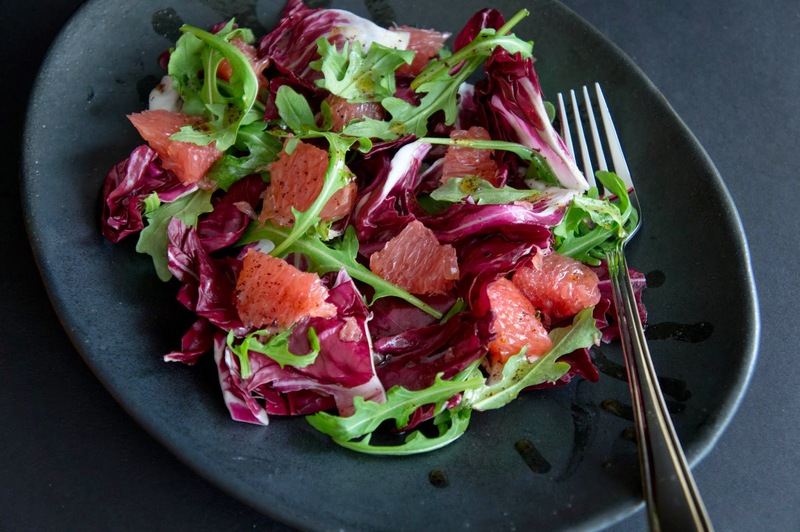 Drizzle dressing over greens and grapefruit in the large bowl and toss to combine. Use enough dressing to lightly coat each leaf. If you have leftover, it will keep in the fridge for a couple of days for another salad! Enjoy salad immediately. Using a sharp knife to cut off the top and bottom of the grapefruit. Go deep enough so that you can see the top of each section in a nice “flower” shape. This might require some trial and error to find how thick the skin is. 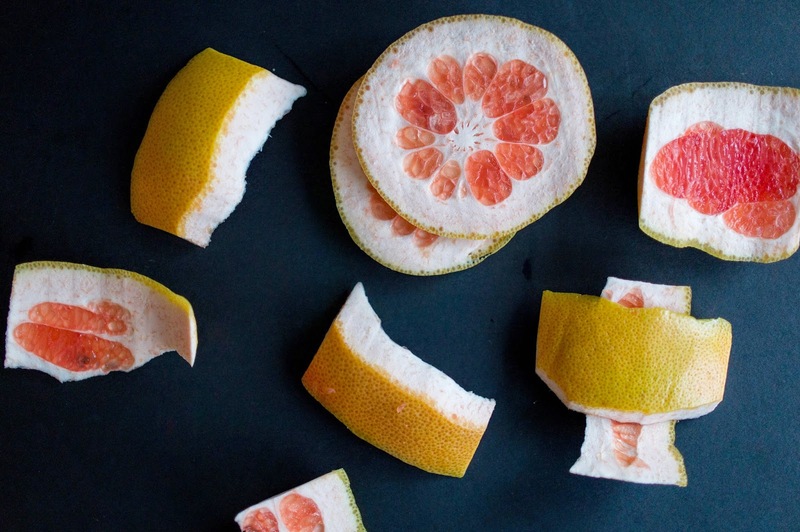 Stand the grapefruit on its bottom and use the knife to run down the side of the grapefruit from top to bottom, cutting off a strip of the peel, pith, and membrane following its natural curve. You want to go deep enough so that the membrane is off the section. This part is tricky and if the skin is quite uneven, you may cut quite a bit of some pieces off. Don’t worry, it comes with practice, and we’ll still use the juice! Once the peel and pith are off, hold the grapefruit in one hand over a bowl with the side facing you. Use your knife to cut down one side of a membrane (you should be able to see them), then the other. Once freed from its membrane, the section should fall out into your bowl. The bowl will also collect all the juice that will inevitably spill. Continue doing this until all the sections are out. You’ll be left with a rib-like structure that still contains a lot of juice. Squeeze it out and use it!